Call2View's Eggstravagant Easter Treasure Hunt. 2017, Adam Hayes, Jody Hayes, Celebrate, Easter, Easter Hunt, Easter Treasure Hunt, Darwin, Events, Real Estate. Come join in on the fun of the Eggstravagant Easter Treasure Hunt! 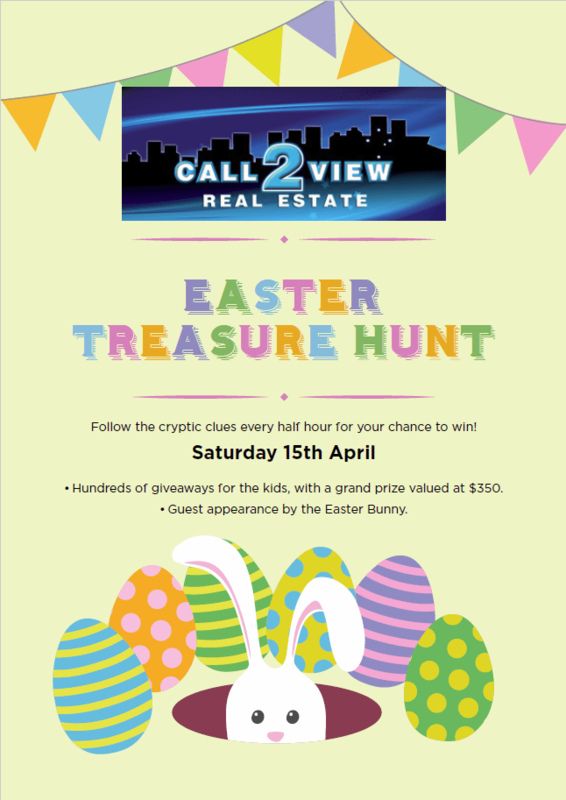 Hosted by Rosebery IGA & Call2View Real Estate, the Eggstravagant Easter Treasure Hunt will take place on Saturday April 15th! Bring the kids in-store to have their photo taken with the Easter Bunny at 9:30am - thanks to Catch the Love Photography. WIN a trolley full of goodies valued at $350. All you have to do is follow the cryptic clues and find the BLUE envelope hidden somewhere in Palmerston! The first cryptic clue will be given out in the underground carpark of IGA at 10:00am. Follow our Facebook pages to receive the other clues given out every half hour. Call2View is also running an Easter Colouring Competition. WIN a FAMILY movie pass to CMAX Cinemas, plus a $100 TOYWORLD gift voucher! Contact our office at [email protected] to get your colouring pages or pop into our office at 9/41 Georgina Cres, Yarrawonga to collect them. Winner will be notified on Thursday 13th April. From all of us here at Call2View - we hope you have an eggcellent and safe Easter long weekend! Get our latest articles delivered straight to your inbox and stay up to date with the latest real estate news and articles from our expert team. It's spam free, and we'll keep your details secure. Are you selling property, or looking for professional management for your investment? We’ve successfully sold over 200 properties since 2011, and manage over 300 properties for investors all over the world. Request your complimentary appraisal today. Our friendly staff are always on hand to help. Get in touch.